Don Petersen: Mulally liked my better ideas. Former Ford CEO Don Petersen says he is good friends with Alan Mulally and may have helped the current Ford boss hone his management philosophy. After Petersen retired from Ford in March 1990 after three years in the top job, he joined Boeing's board of directors. 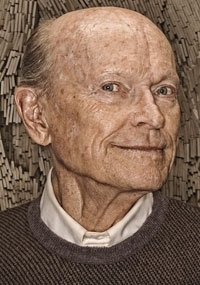 Mulally "was chief engineer of the 777, which was not yet in production," Petersen, 84, said in an interview appearing in the fall issue of Motor Trend Classic. "I had written a book called A Better Idea, which didn't sell that well. But Alan had it and read it and had Post-it notes all through it. "We had a lot of conversations about what we did at Ford and what he might learn from that. He is extremely good as a leader, and he has done a lot of good things to further my ideas because he shares them." -- "I enjoyed the five years as president more than my time as chairman, probably because I was in touch with people all the time and much closer to the product. I never thought of myself as very good at being the public figure for Ford. I don't like giving speeches, and I don't think I did all that well at running the board meetings." -- "My biggest failure was that I did not leave the company with one true advocate for quality or teamwork. If I'd had one true advocate on the board, it would not have gone so haywire."